For the dough, mix maida and salt. Add warm oil to it and mix well with fingers. Add water little by little to prepare it into a soft dough. Cover with a wet cloth and keep aside for half-an-hour. For the stuffing, heat oil in a kadai and season mustard seeds in it. When it splutter add onion, ginger n garlic paste, chopped green chillies and fry. Add haldi, roasted dhania powder, roasted methi powder, garam masala, peanuts and fry. Then add mashed potatoes and salt into it and stir for a minute. This masala should be dry. Remove from fire and cool it. Now divide the dough into small and equal parts. Roll them into round shape and divide it from middle. (Cut in the centre to make two halves). Take one half and fold it in conical shape and filled with masala. Seal the edges of the cone tightly with finger tips deeped in little water. Heat oil in a kadhai. Deep fry the samosas until they turn to golden brown. Don't fry on high flame. Always use a low-medium flame. Remove from oil and soak in a tissue paper. 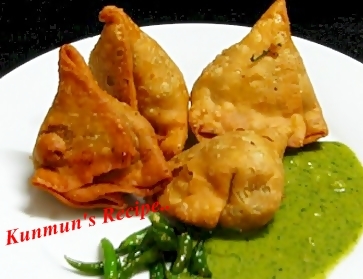 Serve hot samosas with green mint chutney or tomato ketch-up.